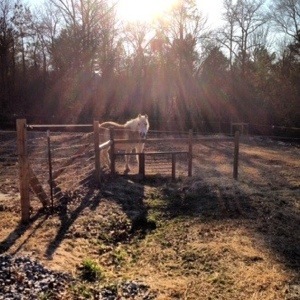 If horses had rear-view mirrors, then after Monday night at Dream Riders I’d be looking at my comfort zone through it. It amazes me that every time I try to form a comfort zone, it quickly gets demolished, which I guess is a good thing and a great way to beef up my coping skills! 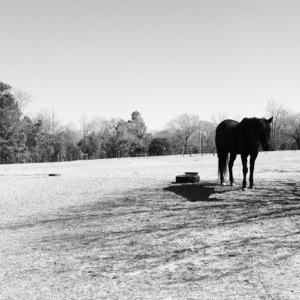 It’s so hard to have a comfort zone when everything changes and I have to work with new horses and riders. I found out that we were short on volunteers Monday night so everyone was pulling double duty just to keep everything running semi- smoothly. I also found out that I would be working with not 1 but 2 historically “challenging” riders…. and on top of that, I would be working alongside my boss… no stress! My first rider of the evening is a little guy named Mark. Mark has severe Autism and is easily over stimulated. He HATES wearing his riding helmet, and if the horse stops for too long, he starts to cry and wiggle around. Last week, he had a complete meltdown and his side walkers had to end his lesson early. Knowing all of this, I was a little apprehensive to work with him- I mean the only meltdown that I’ve ever handled was my own, and that is different! The fact that I would be working with both of my bosses (at different points during the lesson) offered little comfort; it might have made me more nervous. It’s difficult to remember the little rules/protocols when you’re the lead dog because you don’t usually have to worry about them all the time like the rest of us do. That’s fine, and I totally understand that when you’re in charge you can do things that usually aren’t done-like talking to the leader while side-walking. I felt pretty much by myself during part of the lesson because the conversation didn’t involve me, and there was little discussion about what was going on. Please don’t hear this as me speaking negatively about my superiors- I just found the dynamic of the “Leader” in the volunteer position very interesting (among other things.) I became hesitant and began to second guess myself while working with Miss Jennifer and Miss Corky because they have so much more experience than me. I’m not usually like that because I love what I do and I usually take more of an interest in the rider than I did the other night. Thankfully, there were no meltdowns with Mark Monday night! We had a fairly smooth ride and he seemed to enjoy being back in the saddle (literally.) It was difficult to work with him at times because he has a toy horse that he carries with him all the time and he kept playing with that rather than participate in the activities. He also has almost no verbal skills, which also presents its own challenges. Although I understand that these quirks are all qualities of Autism, it still doesn’t change the fact that I’, not 100% sure of how to best work with a person who has a more severe form of Autism than what I am used to. I really can’t wait to learn strategies for working effectively with patients who have Autism. I think, in part, it comes with practice! Since we were so short staffed, I had to work the last lesson, which is a rare occurrence for me! I was working with a teenage rider named Raven who has an anxiety disorder and some sensory “issues” which makes it difficult for her to execute proper riding techniques at times. She loves to talk, and sometimes she fixates on certain topics of conversation. For instance, Monday night, I was told at least 15 times that she had her nails done last week and that she would be getting them done again soon. We could have been talking about worse subjects- but it was very interesting to hear the different ways she made the same story connect to whatever we were talking about at the time. Obviously it was very exciting for her to have been pampered- who can blame her for that?! After all, disability aside, she is still a 17 year old girl. It took me an embarrassingly long time to come to this conclusion- maybe by the fourth time she told me about it. Maybe that simple act made her feel “normal”… don’t most 17 year old girls enjoy having their nails sparkle? I know I did, and still do! She was fixating on it because it meant something to her, not because she couldn’t think of anything else to say! I guess that means that I am at least a little guilty of thinking about a rider in terms of his or her condition… not per-say in what they cannot do, but as a means of explaining why they do the things that they do. I forget that people who have disabilities can do things or react to things simply because they are human: that’s all the explanation needed. I hope that confessing this doesn’t make me a bad person- I would never “dis” a rider’s abilities, but I use the disability as a means to explain the situation around me. I am really thankful to Raven for repeating her story until I came to this realization! It breaks my heart to think that in 3 weeks I will be leaving DR for the summer! I’ve grown used to the routine, even though it forces me to adapt to new things, I still love every minute of what I do… and I think that is the general idea about one’s vocation; even in the midst of challenges and or struggles, at the end of the day you love what you do.. and you willingly sign up to do it again! It amazes me how quickly I have become attached to the horses, the riders, the staff/volunteers, and the general atmosphere of the farm. Tomorrow marks my 3 month anniversary with DR, and I think I love it more everyday. I really can’t believe the impact that it has had on my life already…I know that internships are supposed to help you gain experience and reaffirm your commitment to your chosen career path, but I never imagined that I would feel so strongly about an internship as I do with this one! It was sort of weird today- Miss Jennifer and Miss Corky wanted to know if I was coming back to volunteer in the fall when school started up again, of course I said I would come back if they’d have me. I honestly think that I have to continue to volunteer here so that I maintain my sanity. As I’ve said before, I find the barn to be extremely soothing. They both said that they were so glad that I was interning with them-and they thanked me for my willingness to help out. It was nice for them to thank me, sometimes I feel like they are helping me way more than I am helping them. Today I was reunited with the old team-Me ,Zach, Mollie, and Amanda (Zach’s other side walker.) Zach apparently missed me because he was super vocal today and laughing.. which he hadn’t done since I switched riders. He also was saying “walk” clearly on the first try, which has been a struggle since my first day-apparently he hasn’t been saying it much since I’ve been “away”. I had really missed working with him. 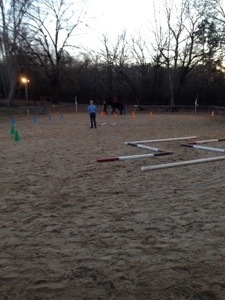 He is such a calm rider, and he never ceases to amaze me each week with something new that he shows me he can do or say. Autism is a funny disorder- it really doesn’t make sense sometimes in the way that it manifests in different people and different forms within the same person. Example: Zach knows all of his colors,numbers, farm animals, and shapes, but he has trouble saying the word “walk” clearly. He can say other things just fine, but walk gives him trouble. It’s really bizarre. He’s inspired me to write my abnormal psychology research paper on Autism so that I can learn more about it, and hopefully be able to interact with him in a more effective way! Monday’s always leave me exhausted, so I’m going to sign off! I’ll post again soon, not Thursday though because I won’t be at the farm. Thanks for reading! Yesterday was a special kind of Saturday- I actually got to go to the barn! We had to give 2 make up lessons. 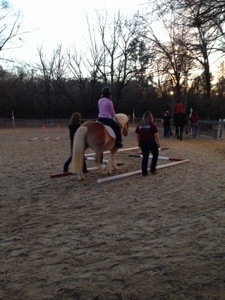 You see, the riders families pay for the lesson season in advance, almost how you would pay college tuition. So it is important that the riders are getting as many lessons as their parents paid for. The weather in South Carolina has been super strange so far in 2014, and we can have lessons if the weather is bad! That’s why we’ve had to do more Saturday lessons than normal this “season.” You won’t hear me complaining- it was a B-E-A-utiful day at Dream Riders!! I was a little surprised to see my name listed as a leader twice on the all knowing clipboard that holds our assignments. I was even more surprised to learn that I would be leading a horse named AJ, who can be a little cranky when it’s time to got to work. I’ve lead AJ once before, and that didn’t go as well as I had imagined… but, one of the characteristics of being an intern is doing what you’re told without asking why. So that’s what I did! Let me tell you a little bit about Mr. AJ so you know what I was dealing with. 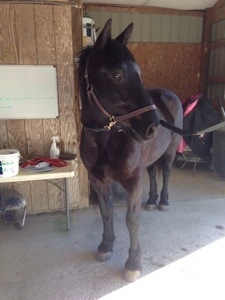 AJ is a 20 year old Halfilinger gelding. We’re the same age.. which is kinda neat! 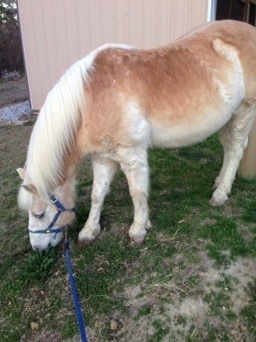 AJ has been a therapy horse for a realllly long time and is ready for retirement (mentally, at least.) That being said, it’s understandable that he gets crabby about working. He doesn’t do anything to endanger the riders when he gets like this, but he’ll occasionally just stop walking- and the leader has to coax/drag him in order for him to “walk on!” I was nervous to lead again- it can be stressful enough to lead a horse that doesn’t stop all the time, and it’s really nerve wracking to know that the horse that you’re leading has been acting the fool recently! I actually did a much better jo b at leading yesterday, which made me proud of myself! Coincidentally, we did a barrel pattern yesterday that we did the last time I lead, so I had an advantage of knowing where I was supposed to be leading AJ. It’s amazing what one can accomplish when one isn’t given a choice! I didn’t want to be intimidated or afraid to lead just because my last experience didn’t go as I planned. I’m glad that I stepped up and just did it! Leading a horse in the therapy setting requires the leader to pay attention to everything: the horse, the rider, the side walkers, the positions of the other horses and riders, and the instructor… all while keeping the horse in check (or in my case-in motion!) It’s like multitasking time 1,274!! The ability to multitask is an important skill to have as an OT because you always have to be aware of the patient and your surroundings. Right now, it stresses me out a little because I’m still new, and I guess I feel like that makes me more prone to mistakes. I have no doubt that I will become more comfortable with leading as I have more and more opportunities to practice it,though. I was thankful that the DR staff had faith in me to lead AJ not once but twice yesterday. I was much more confident while leading in the last lesson. 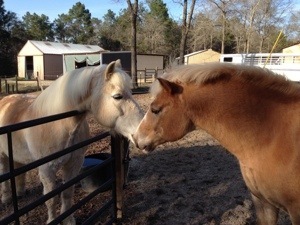 I think AJ and I established a good leader/horse relationship. I wasn’t in the mood to deal with his shenanigans, and he could tell- so he didn’t stop as often! Miss Jennifer, the head riding instructor, said that she wanted me to lead yesterday because I am about a foot taller than the woman who usually leads AJ. Therefore, I have a more dominating presence because I am taller. I overheard Miss Jennifer tell someone that AJ was walking so much nicer for me… which was great to hear! I’m glad that I am able to work in any position that is available during lessons. That makes me feel that I can be of greater use to the DR staff. There’s a quote that I like that says “everything seems impossible until it’s done.” I definitely feel that this quote is applicable to my DR experience so far. I remember sitting in the barn during the training session almost 2 months ago thinking “what am I getting myself into.” But now, I just show up at the barn and do my thing with little to no help from anyone else. I’m sure that leading will have the same result… as I mentioned in an earlier post, I’m not very patient with myself. I expect perfection on the first try, which doesn’t happen that often! This internship has really helped me become more patient and forgiving with myself since I am virtually new to the whole therapeutic riding process! Spring has arrived at Dream Riders as of yesterday-the air was warm and the flowers were in bloom, but the most telling sign that spring has sprung was the massive amount of hair that was shed yesterday! I swear, I had enough excess horse hair to make a Shetland Pony (or 2!!) Needless to say, I felt like I brought half of the barn with me when I went home last night… so.much.horse.hair! It was wonderful to fall back into the swing of barn life after my break last week. During Spring break, the barn was always on my mind. Someone would say something, or I would notice something that would remind me of one of the riders. I met this girl named Daisy on my trip to Isle of Palms, SC and I accidentally called her Daisy Lava Girl (the pseudonym of one of the riders). I nearly died of embarrassment, but it warmed my heart to realize just how much this experience has had on me- and it’s only been a month ! Almost everything that I do in my “real life” (life outside DR, that is) seems to relate to what I do at DR, which has to be a good sign, right?! So….about last night… yes it was wonderful to be back, but there was a TON of excitement that happened. I worked with James again last night. If you’ll recall, James is 4 years old and has Down Syndrome. I’m 99% sure that the extra chromosome makes him extra cute- I just love him! He’s so happy and so very silly! James seems to love adventure; he’s certainly not shy! He is so small that he doesn’t need to sit in a saddle- which means that his side-walkers (like me) need to pay close attention and hold on to his feet so that he doesn’t lose his balance and fall off the horse. 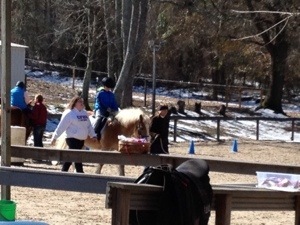 At the end of each lesson, the riders go on a trail ride around the outside of the ring. There are a few fun obstacles throughout the trail that are designed to stimulate some sensory functions… plus, it’s super fun :). One such obstacle is the noodles. Basically, they are foam pool noodles that hang down like the octopus cleaner things in a car wash: same principle, really! Well, Mr. James, being the adrenaline junkie that he is, tipped himself back whilst going through the noodles and proceeded to slide off Malchi… thankfully, he didn’t hit the ground. He was caught long before he hit the ground by the other side walker. WOW- it all happened so fast, Malchi almost ran me over trying to get out of the way(he was doing the right thing), and I watched as the laws of time and space were being bent before my very eyes… in reality, I probably stood there looking like a dead fish with bulging eyes and my mouth hanging open. Little James didn’t shed a tear, or even look sad for that matter! He was smiling and ready to get back on the horse… bravo, James! I had never experienced anything like that before, and it really is a rare occurrence at DR (thankfully). It just serves as a reminder to always be alert when working with patients-things like this can, and do, happen quickly. Whew- just writing about it makes my heart race… I’m glad that everyone was alright, and that (as a group)we remained calm. In other, not as exciting news, I am making great progress with Lou! 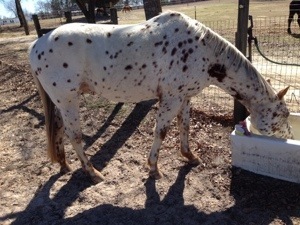 For the first time ever he let me pick (clean) all 4 hooves! Apparently he’s particular about who can mess with his feet, and it’s about time that he let me! I’d be lying if I said I was above a little bribery 😉 I brought him a green apple from my fridge and gave it to him when I first arrived, and then promised him treats if he let me pick all 4 feet without being difficult-success!!! He has been such a trooper while I relearn the ropes of horse care- he probably deserves more apples in the weeks to come for putting up with me!